The Women’s Centre is a safe place for women to drop-in and receive support. Hello! 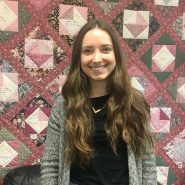 My name is Emma and I am a practicum student with the Work for Change team. I’m currently completing my first year of a Masters of Social Work at the University of Calgary, where I’m specializing in International and Community Development. I try to spend as much time as possible outside: I love hiking, rock climbing and camping. I have a silly sense of humour, and always appreciate a good pun! What is your personal definition of feminism? Feminism, to me, means promoting all women’s equal participation in all areas of society. I think every woman’s voice should be heard and valued in the community, that women should have equal representation in politics, and that each woman’s strengths should be appreciated and celebrated. What brought you to the Women’s Centre? I was interested in the Women’s Centre for many reasons, one of which being the fact that it’s an inclusive community of strong, resilient women whose voices are valued, and where there is space for each woman to participate in discussions around initiating change. I was also drawn to the Women’s Centre as it is a place where women have an opportunity to act on issues in their community, which is something that is important to me. What’s one thing you hope to learn at the Women’s Centre? I would like to learn how women can be involved in making changes in their community. I’m particularly interested in learning more about how we can transition from acknowledging and understanding issues in our communities to creating meaningful change around those issues and policies. Describe a woman who you admire or who has influenced your life. My mom influenced my life and I admire her for many reasons. I remember her bringing me to women’s marches and peace rallies at a young age, showing me how strong a group of women can be when wanting to create change. She has also taught me the importance of building meaningful relationships with others: whether it’s in her personal life or at work, she prioritizes making connections with other people and getting people together. ← Meet Shola, our new Basic Needs Coordinator!